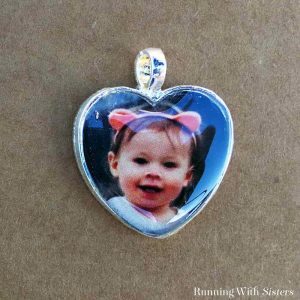 Have you ever wished you could turn a favorite photo into a photo pendant? It’s easier than you think! 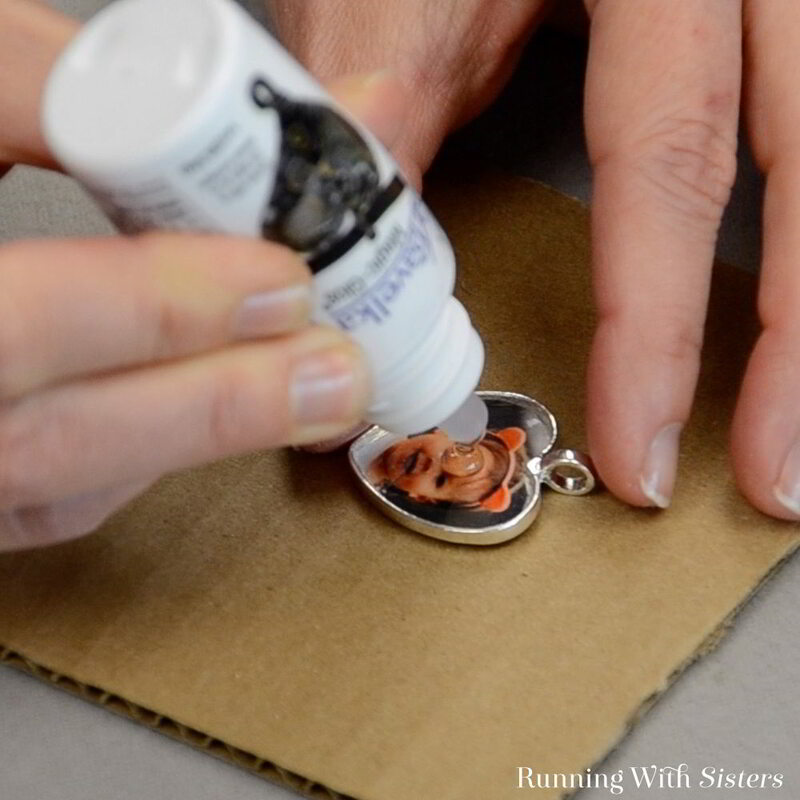 We have a video tutorial and complete written instructions to show you just how quick and easy it is to make a photo pendant. 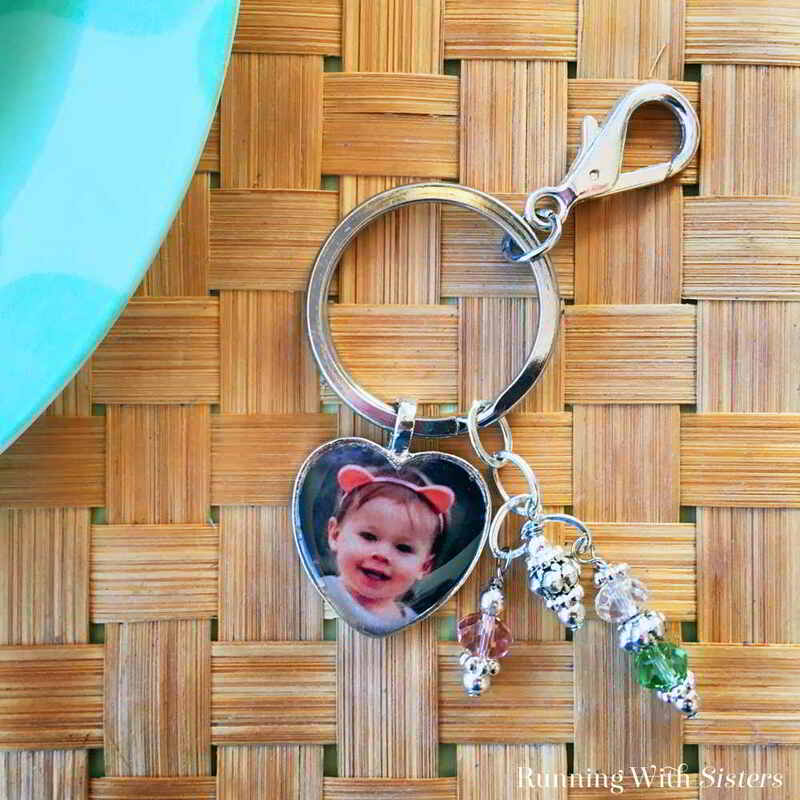 You can hang your photo pendant on a chain to wear as a necklace, on a hook to attach to your purse, or turn it into a key chain like we did. Here’s the complete video tutorial. It’s broken into two sections. 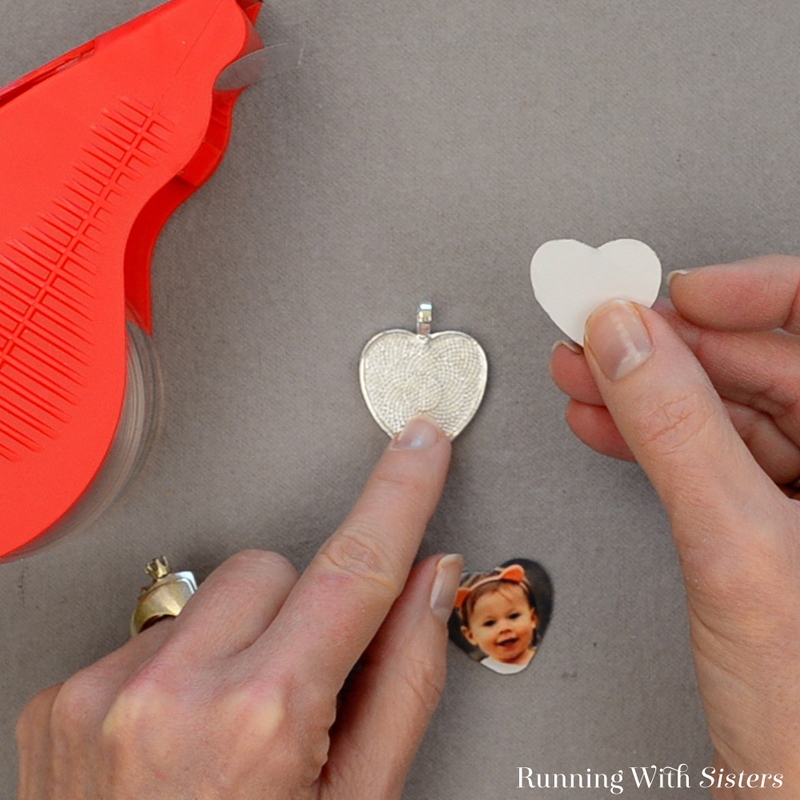 First we’ll show you how to laminate and resin the photo to make the photo pendant. 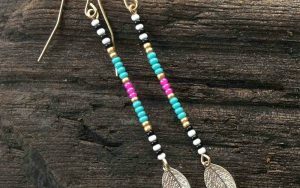 then we’ll show you how to make crystal bead dangles to go with the key chain. We recommend choosing a photo where the face is bright and clear. Make sure the face stands out from the background. Resize your photo to fit in your silver heart bezel. Then have it printed on a laser printer. We always go to Fedex for this. Trace the shape of the bezel onto the photo (we made a little paper template) and cut it out. Then trim the photo to fit inside the bezel. Next you’ll need to laminate the photo. 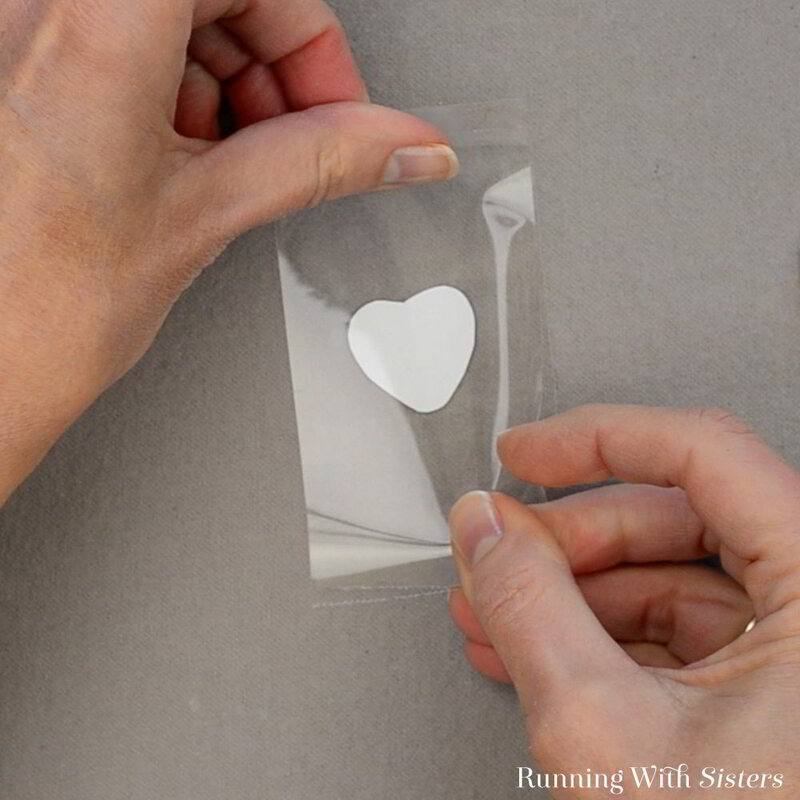 (If you don’t laminate the photo the resin will seep into the paper and make it look wet and muddy.) You can laminate the photo by taking a piece of packing tape and placing it across the front of the photo. Then place a second piece of packing tape on the back. Rub around the edges of the photo to seal it in. Cut out the laminated picture leaving a thin sealed border all the way around the photo. Smear the glue stick on the back of the laminated photo. Press the photo into the bezel. Let dry. Now for the magic part: Magic-Glos! Squeeze the Magic-Glos resin onto the surface of the laminated photo covering the picture entirely and filling up the bezel to the edges. 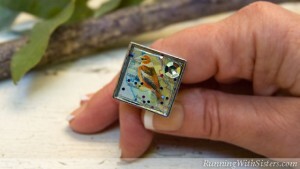 The resin is made to dome up so keep squeezing until the whole bezel is full and slightly domed. Pop any bubbles or fish them out with a toothpick . Immediately carry the photo pendant outside. Set it on a level surface to cure in direct sunlight. This should take about 15 minutes. 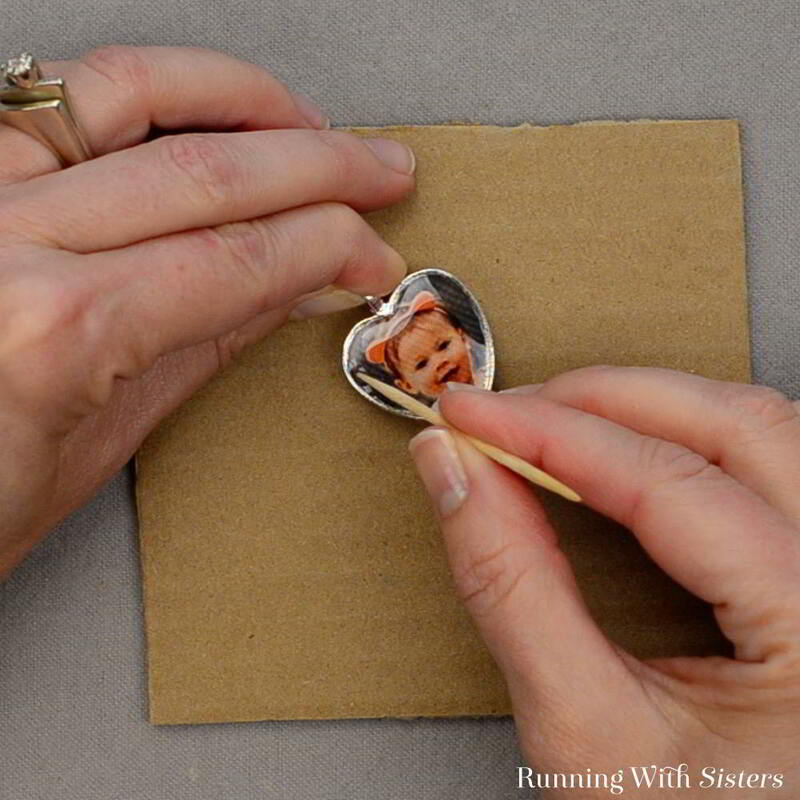 After fifteen minutes, test the resin by poking it gently with the toothpick. (Poke in the edge, not the center, in case it’s not cured yet.) Put the photo pendant in more direct sunlight for a few minutes longer if needed. Cut a piece of chain four links long by cutting the fifth link with the wire cutters. 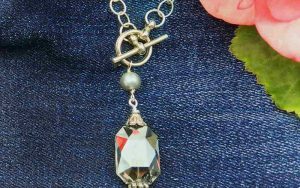 Feed a round silver bead, a silver daisy spacer, a Thai bead, another silver daisy spacer, and another round silver bead onto a headpin. 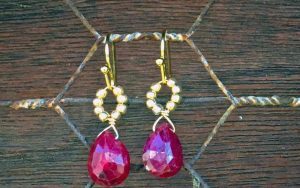 Grasp the headpin above the last bead using the round-nose pliers. 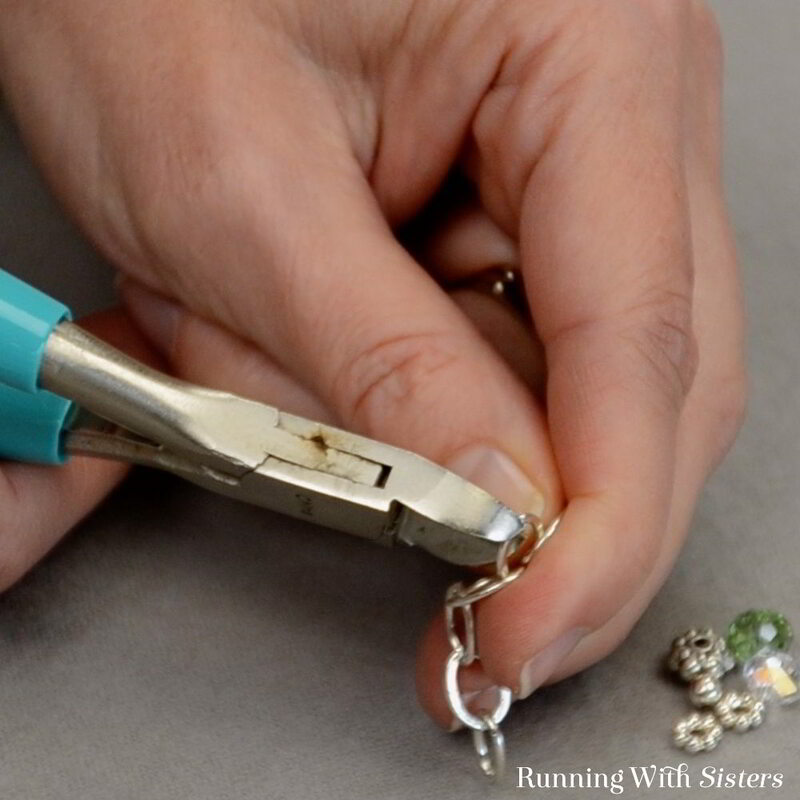 Make a 90-degree bend in the headpin wire by pulling the tail over the top of the pliers toward you. Reposition the pliers to the top of the 90-degree bend. Make a partial loop in the wire by pulling the tail away from you up and over the top jaw of the pliers. Reposition the bottom jaw of the round-nose pliers into the partial loop. Pull the tail the rest of the way around to make the complete loop. Slide the loop in the headpin wire onto the 2nd link in the piece of chain. Grasp across the loop with the round-nose pliers. Wrap the tail around the neck 2 times. Trim the end of the wire using the wire cutters. 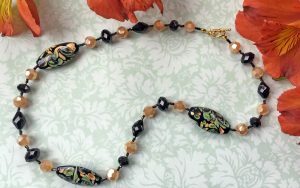 Repeat Step 2 to make 2 more bead strands. 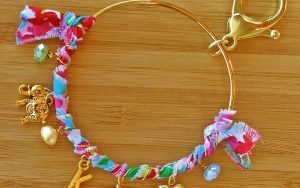 Be sure to attach them to the other links in the chain before you wrap them. We made one bead strand with a round silver bead, a silver daisy spacer, a pink crystal, and a silver bead. We made a third bead strand with a round silver bead, a silver daisy spacer, a lime crystal, a Thai bead, a clear crystal, and a silver daisy spacer. 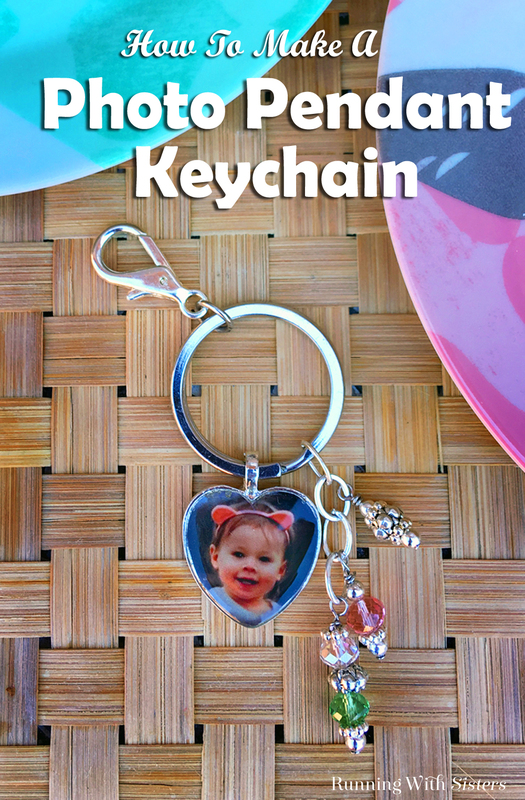 Open the split ring of the key chain and slide on the top link of the chain. Next slide the photo pendant onto the split ring of the key chain. You are all done! Isn’t that lovely? Of course, you can load it up with your keys now and carry it with you, but we also think it’d be fun hanging from your purse. 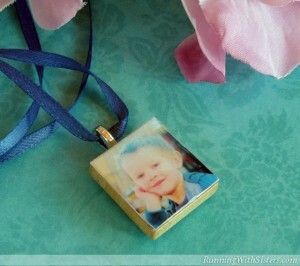 And if you have any questions about the photo pendant or the key chain, leave us a comment and we’ll reply. We love to help! this looks like WAY too much work! lol…too many steps! Lol! 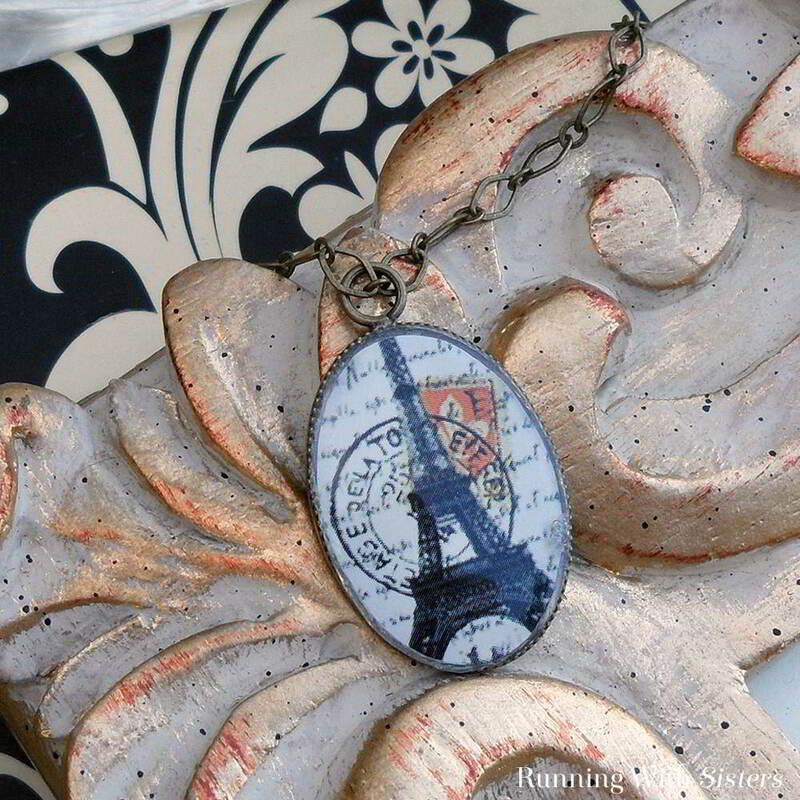 You can make the pendant and just hang it on a store bought keychain!